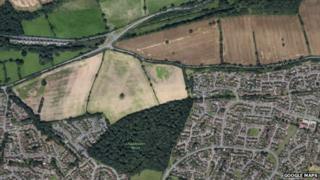 Plans to build 250 homes on the edge of Derby would pose a threat to wildlife in a nearby wood, a campaign group says. Friends of Chaddesden Wood are starting a petition against the project proposed by JGP Properties in Oakwood. Protester Maggie Cooper said the wood was "an oasis for birds and other wildlife". But a project spokesman said "a green corridor" would be maintained to allow wildlife access to the wood. "Birds, bats and butterflies use the wood and it's a precious piece of ancient woodland," Ms Cooper said. Mrs Cooper said the plans, which have not yet been approved by Derby City Council, would also create more traffic in a neighbourhood that "already has problems" with congestion and flooding. The developer JGP Properties said the project "will conserve and enhance wildlife and habitat diversity on the site". The firm said a "nature corridor" would be included to encourage wildlife to use the site and Chaddesden Wood. It also said bat and bird boxes would be installed and trees and hedgerows would be retained throughout the development. The project would have up to 30% affordable housing and the location has been identified as "suitable" for housing in the city's growth plan, the firm's planning application said. The consultation phase of the planning application ended on 4 May. A final decision is expected from Derby City Council by July.